If you expect every bit as much out of your equipment as you invest in your training, then you're in the right place. The new XTR group doesn't just ask to be pushed at race pace, it demands it. This is the Shimano XTR M980 I-Spec Direct Mount 10 Speed Rapidfire Pod Shifter. ISpec design is developed to attach directly to XTR M985 / M988 brake levers. 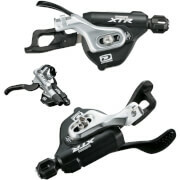 Shimano sets the benchmark with the next generation of mountain bike shifting, Dyna-Sys 10-speed XTR Rapidfire with Vivid indexing are there slickest shifters yet. Light to the touch but positive and crisp, Vivid indexing provides a constant amount of shift lever force across all 10 sprockets. Instant Release for super fast shifts, delivering the chain to the next gear the moment the lever is actuated with no hesitation. Multi Release allows multiple gear changes from both levers with one sweep, further adding to the speed of shift.